Trichotillomania is a disorder of poor impulse control. The patient experiences recurrent urges to pull his or her hair to relieve stress. The manifestation of these impulses varies with stress.1 The resulting baldness can significantly impair quality of life and functioning. It has a chronic course consisting of frequent remissions and relapses. Trials of naltrexone and N-acetylcysteine (NAC) have shown reductions in symptoms.2,3 Trichotillomania has no US Food and Drug Administration-approved treatment, but management modalities may include novel psychopharmacology regimens with an approach to increase the efficacy and durability of clinical improvement. The patient was a 23-year-old woman who was a US Navy veteran. At the age of 21 years and while on active duty she sought treatment for anxiety and stress caused by difficulty in adjusting to her work environment. This stress resulted in hair-pulling behavior in which the patient pulled hair from her eyebrows and eyelashes, providing a sense of gratification and temporary relief from stress. Previous treatments for her anxiety included sertraline and fluoxetine, but she discontinued them due to lack of efficacy and adverse side effects. Upon presentation to our hospital, she was assessed on the Massachusetts General Hospital Hair Pulling Scale (MGH-HPS) and had an initial total score of 17 (maximum score is 28). She was prescribed naltrexone at a dose of 50 mg daily. 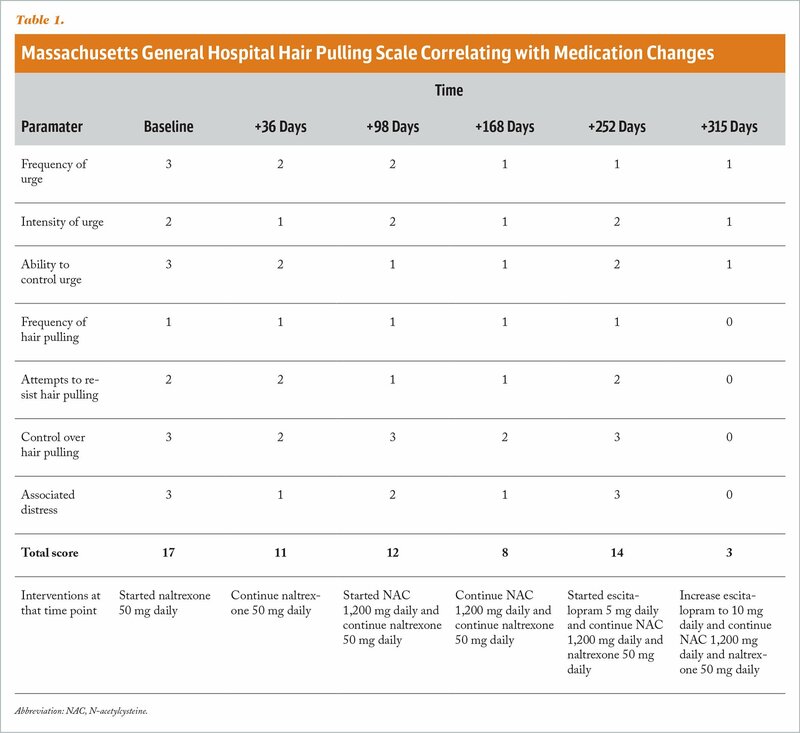 The patient demonstrated an early response with no side effects and reduction of MGH-HPS score to 11 after about 2 months, followed by a plateaued response (Table 1). NAC at a dose of 1,200 mg daily was added, resulting in a decrease in MGH-HPS score to 8 and a 3-week period without any hair pulling. The patient relapsed 3 months later after experiencing financial and social stress, with her MGH-HPS score increasing to 14 during this time. Escitalopram at a dose of 5 mg daily was added to her regimen and was increased to 10 mg daily about 2 months later, after which the patient showed clinical improvement with an MGH-HPS score of 3, even in the presence of ongoing stress. Selective serotonin reuptake inhibitors (SSRIs) are traditionally used as a first-line treatment for trichotillomania, but patient response is varied and adherence is often poor.4 In the case presented here, the NAC and naltrexone resulted in a significant reduction in hair pulling until added stress resulted in relapse, which was relieved by the addition of escitalopram, resulting in sustained and significant clinical improvement. This case supports the hypothesis of a combination of NAC, naltrexone, and an SSRI as a treatment option with improved clinical outcome. Because so few treatment options are available, it is important to evaluate novel singular or combination psychopharmacological therapeutics. Further research with combination medication regimens should be conducted to improve the treatment of trichotillomania. Lewin AB, Piacentini J, Flessner CA, et al. Depression, anxiety, and functional impairment in children with trichotillomania. Depress Anxiety. 2009;26(6):521–527. doi:10.1002/da.20537 [CrossRef]. Ritvij Satodiya, MD, is a Postgraduate Year-2 Resident, Department of Psychiatry, Stony Brook University School of Medicine. Deina Nemiary, MD, MPH, is the Chief Psychiatrist, Near North Health Service Corporation. Alyssa Peckham, PharmD, BCPP, is an Assistant Professor, Department of Pharmacy, Midwestern University, Arizona. Douglas Boggs, PharmD, MS, BCPP, is a Senior Medical Science Liaison, Syneos Health. Address correspondence to Ritvij Satodiya, MD, Department of Psychiatry, Stony Brook University School of Medicine, 101 Nicholls Road, Stony Brook, NY 11794; email: ritvij.satodiya@stonybrookmedicine.edu.